Whatever run, cycle, walk or jump you’re doing, we would love you to use your place to help us change the lives of homeless people in London. Homelessness and rough sleeping in London are on the rise, and our work is needed more than ever. With your help, we can provide accommodation and support services to some of London’s most vulnerable people, enabling them to move on to independent living and achieve their full potential. A brilliant race day experience – if we can be there, we will be! Have you entered the ballot for the Virgin Money London Marathon 2019? We would love to hear from you! Join #TeamEvolve and run one of the Worlds Marathon Majors for the future of homeless people in our capital city. As a ballot runner, there is no minimum sponsorship. We would just ask you to aim for a fundraising target of £1,500 and we will be there to support you all the way to smash that figure. Katie Hatrick, London Marathon 2018 finisher. Please get in touch if you get lucky and secure a space. 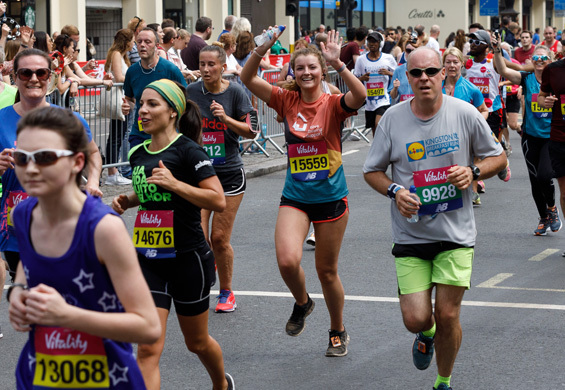 And if you missed out on a London Marathon slot this time but still have the marathon twitch, don’t panic – we have places on the 2019 Brighton Marathon! Get in touch and we’ll sort the rest! We cannot wait to get you involved in the movement to end chronic street homelessness in London. Want more? Check out these other challenge events. We would love you to take one on and support our work. To volunteer to help at one of our hostels for homeless people in London, click here.